At the very moment I am posting this, a friend of mine is going through some really bad stuff. I feel sad, mad and kind of sick. 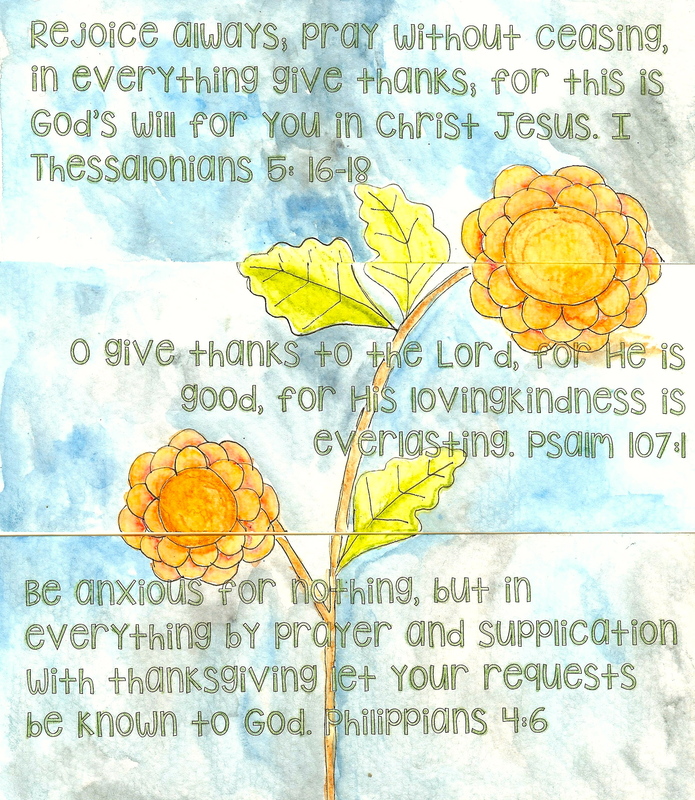 It is pretty hard to think about rejoicing and giving thanks. But lo and behold, this is exactly when God speaks, right? I can rejoice in my salvation, hope and a future. Certainly, I am praying for mercy for my friend. If I try to have a prayerful attitude all the time, and keep God in the forefront of my consciousness, that is when it becomes easier to pray short spontaneous prayers. And of course, I really have so much for which to be thankful. Even when it seems like evil trumps, I still have God Almighty as my Heavenly Father, and know that He is in control of everything that is happening. It is about focus, right? Worry = lack of trust in God. When I have so much on my mind, that thing where I try to replace it with God on my mind is oh so very good. Some days it is easier than others, but the days I succeed carry so much less stress. When I get a flash of emotion, or of the bad thing, I turn it immediately into a prayer. It doesn’t have to be a manifesto, just a short prayer to remind me that God has this. I am working on that this very night. I love how God reminds and comforts. I should be on page 16 today….just a little behind…but today is the day that I needed to work on these three pages. Another reason to give thanks to the Lord and His scheduling. 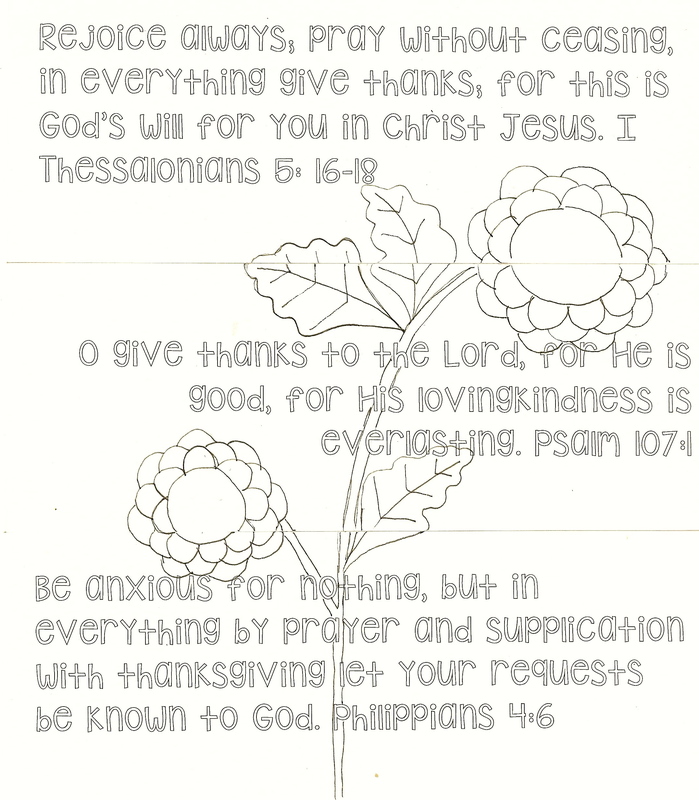 Here is the printable pattern. Mine is 8 1/4″ tall and 7″ wide. You can see the lines to cut the piece into 3 parts. 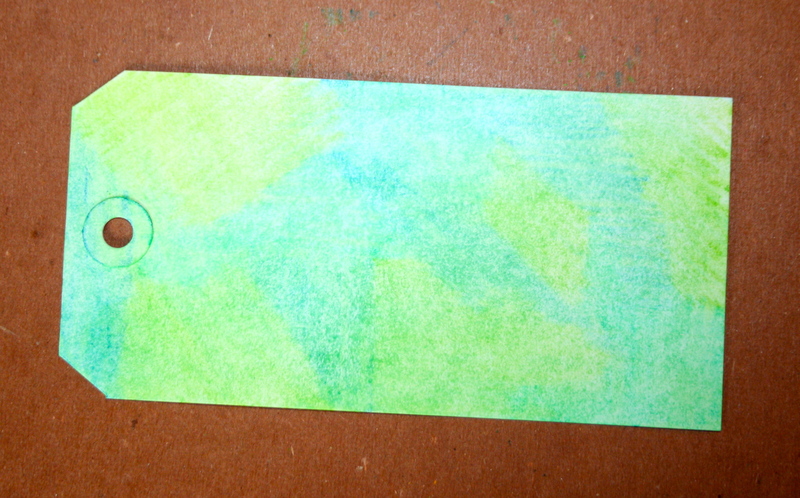 If you are not making a book, this make 3 nice size bookmarks. 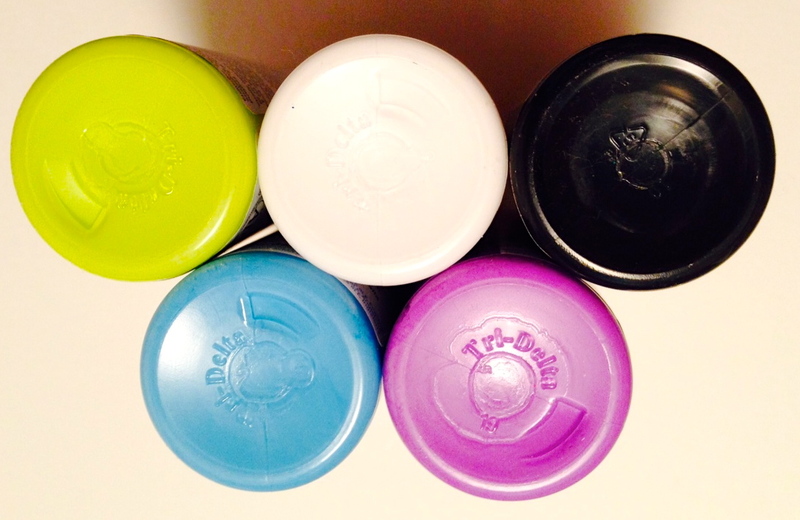 Color at will. I used watercolor pencils on watercolor paper, as usual. And I will put this into the book like it is one page. For many years, I have been telling the Lord the desires of my heart. Yeah, I know He knows, but James 4:3 says I have to ask if I am going to get what I want. It is a comforting, hopeful, even exciting verse, isn’t it? And I realized, I have been waiting for God to grant me my desires, but I forgot about the first part of the verse. Have I been delighting myself in the Lord? And what in the world does that even mean? So, yesterday, I spent 3 1/2 miles walking and talking to God about just that. 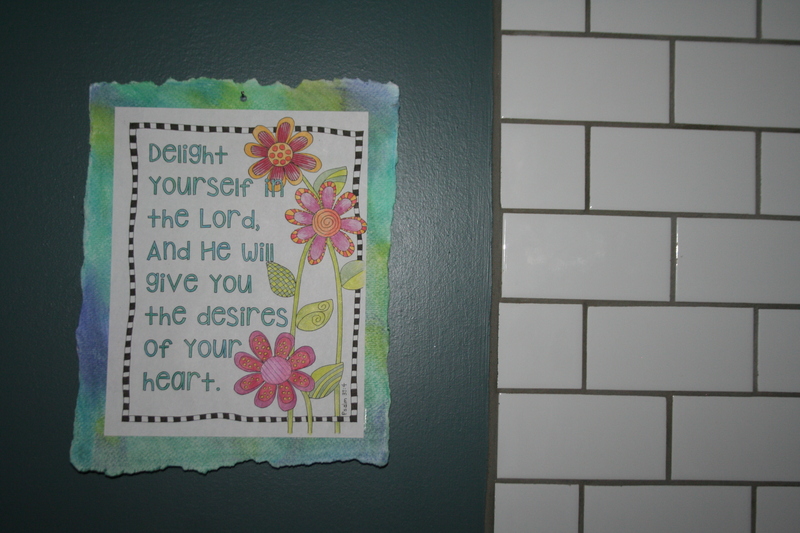 How can I delight myself in the Lord? Find the good parts of everything. Even in a day or a project that is frustrating or failing, I can find good parts, and be thankful for what I am learning, and the time I spent with God asking for His help. Be in the word. I know it sounds like the Sunday School answer for all questions for believers. 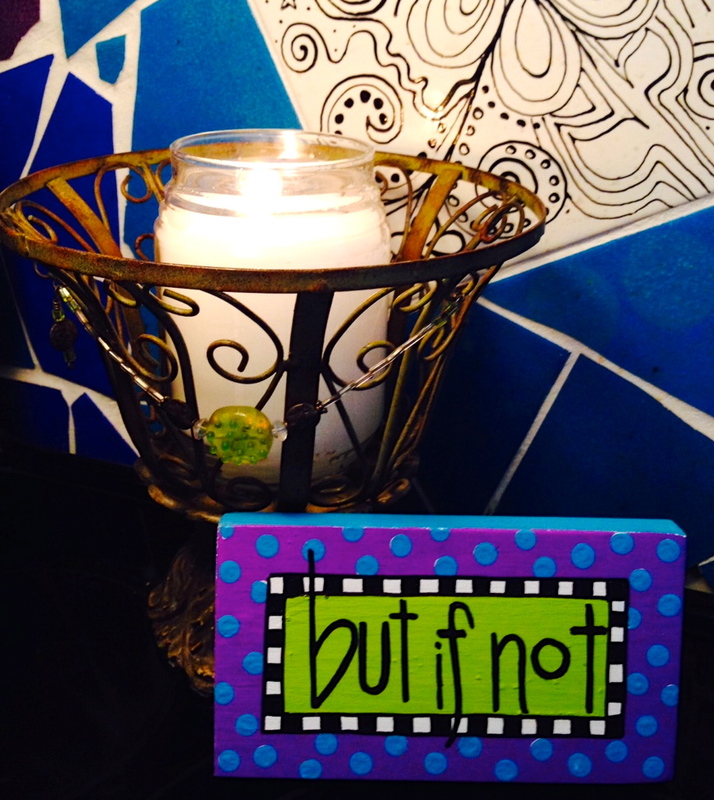 But, haven’t you been in study and read scripture that makes your heart flutter? Even if you have read it a hundred times before, TODAY, it brings you unexplainable joy? And it is so good that you have to call your friend to talk about it, and put it on your Facebook page? DELIGHT! And sometimes when you are singing a song of praise to God, doesn’t it choke you up and bring tears to your eyes that God Almighty chose you to be His very own child? The easiest way for me to find delight in the Lord is to go outside. I am a visual person (as you know from this blog), and I can walk for miles marveling about how many colors of green God has given us… how each season has it’s own beauty…. how the leaves on the wind make patterns in the sky? If I pay attention, I can do that all day. It is pretty awesome when I pay attention. And then I did a word study on the word “Delight”, from the original Hebrew. I had to look it up twice because it did not make sense. But as I thought more about it, the better it got. 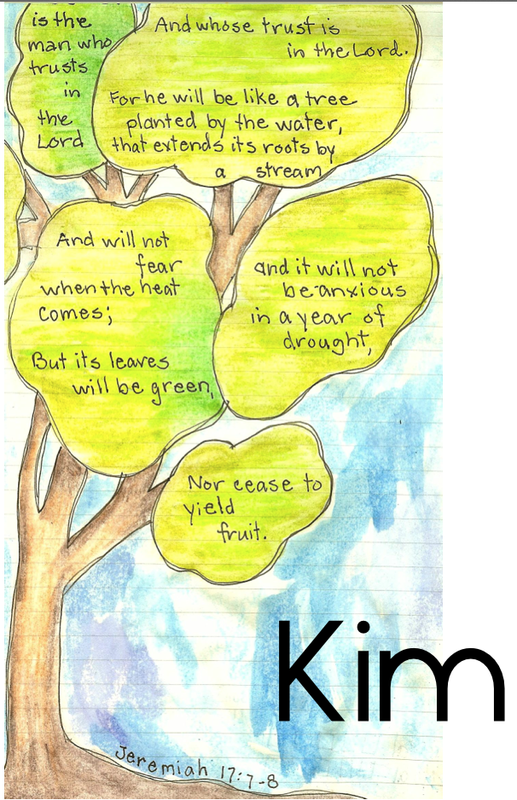 In this verse, it means to be soft and pliable. Is it possible for me to delight in anything when I let the frustration crank me up? Or when I am not ready and open to hear the hope in God’s word or heartfelt praise in a song? This verse is saying be soft and pliable in the Lord, and He will give me the delights of my heart. Meanwhile, to help keep it fresh in your mind, I am giving you a coloring page. Click on it. Print it out, any size you want. Here is what I did with mine. I printed on regular white copy paper and colored it with colored pencils. Add any patterns to the flowers and leaves that you want. Color it any way you wish. Click on my pic to make it large enough to see the details….just for ideas. Then I tore the edges on a piece of watercolor paper, and did this watercolor background technique with watercolor pencils. 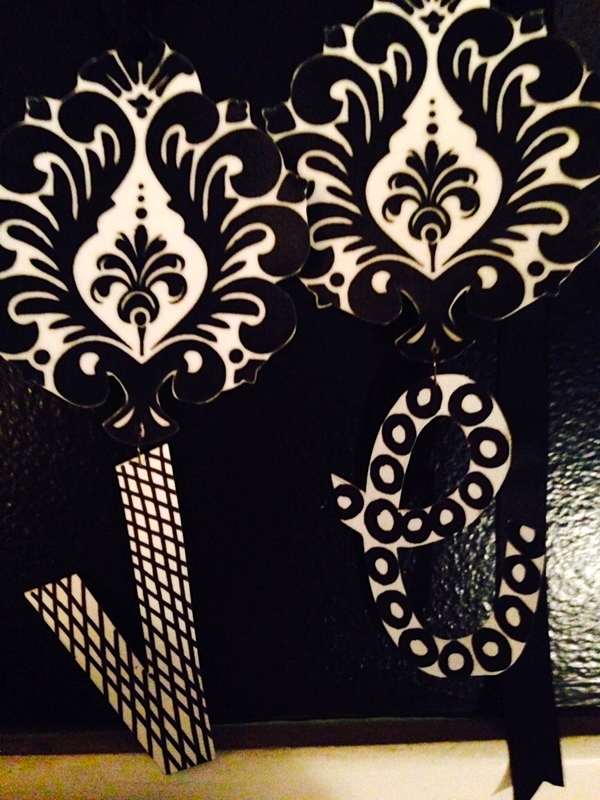 I attached the white paper (using double sided tape) to the background, and…. …hung it on my bathroom wall. I will see it many times a day and it will remind me to be pliable in the Lord. 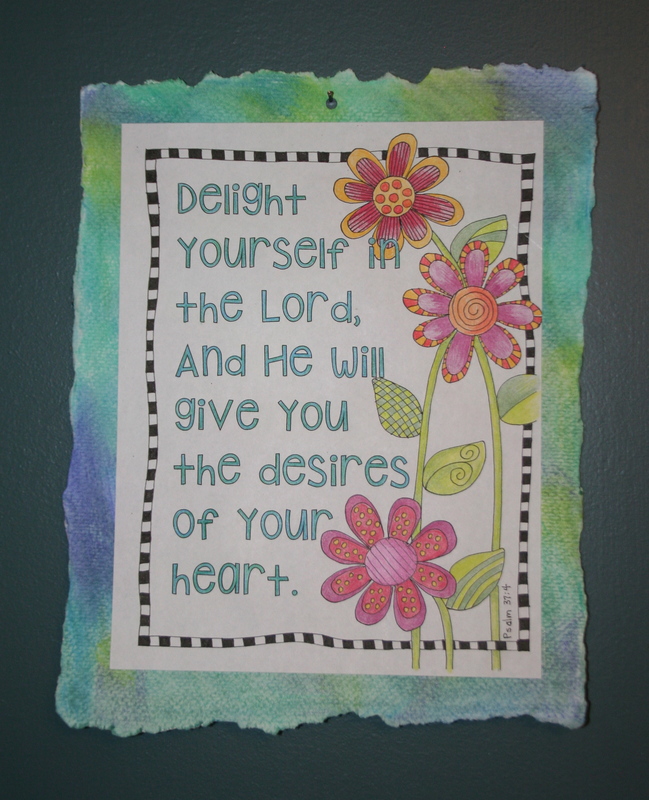 I would love to know how you delight yourself in the Lord, or how you are planning to delight yourself in the Lord. Please share your great ideas in the comments. And thank you! This geranium is on my daily walking path. In the early summer, it was blooming like crazy, lush and in gorgeous color. It is sitting by the fence and it has not been taken care of. At all. It never gets watered unless it rains, and it has never been pruned. 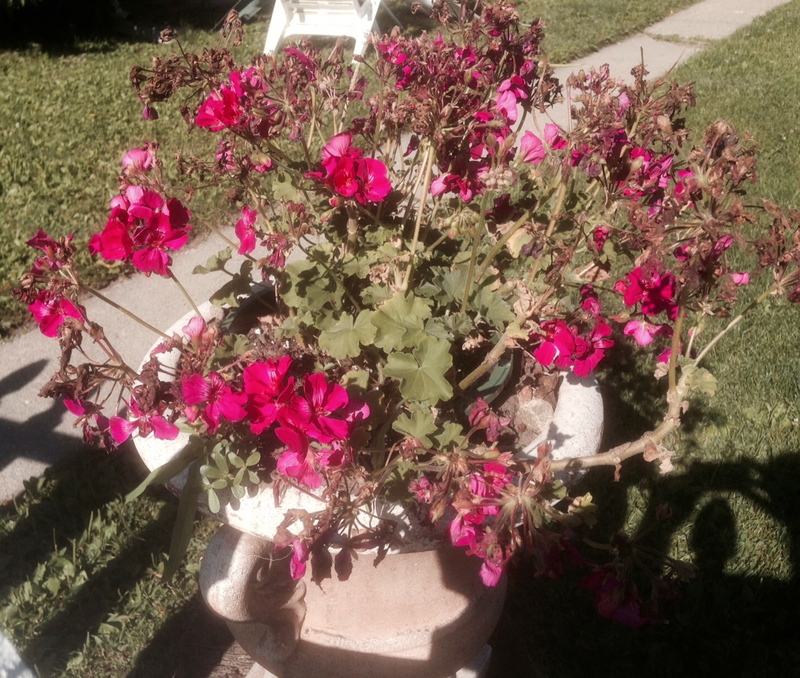 Gardeners know that pruning off the dead blossoms allows the plant to make new blossoms. When I walk by each day, it makes me sad. And I wonder if the owner would care if I deadheaded the blossoms when I walk by. Even though it is sad that it can’t bloom well, it reminds me every day that My Father, the Vinedresser, prunes things from my life in order for new and beautiful things to blossom. I cannot be sad about that. Why would I want to hang on to things that are done? 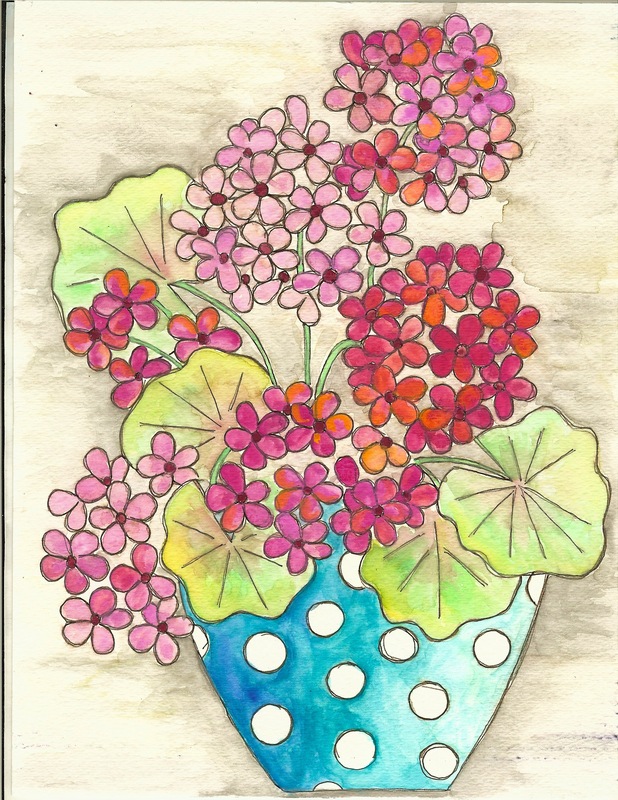 As a reminder of why it is good to have things in our lives pruned, I offer you a drawing of a geranium in bloom. I have been reading lately about how adult coloring books are the thing. Publishers cannot keep them in stock. Doesn’t it sound relaxing to sit and color while watching TV, or while waiting for your Dr. appointment? They say that coloring can take care of your stress and anxiety. Check them out on Amazon. They have a pretty decent collection. 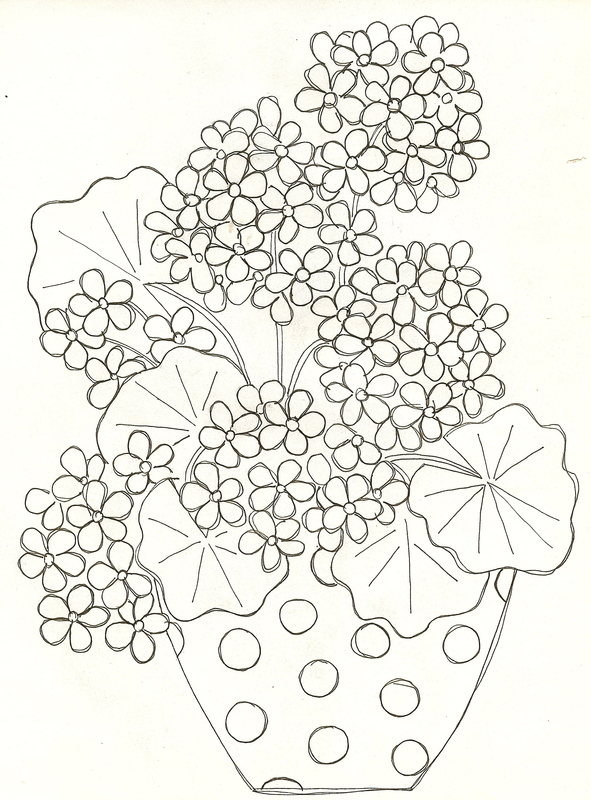 Print out the geraniums. Grab your crayons or colored pencils, or print it on watercolor paper, and use your watercolor pencils to color it in. No stress, just chillin’. I painted mine with watercolor cakes. It was fun. Right now, I have a pretty big need in my life and I am learning to wait on the Lord for it. I want it and need it now, and God is allowing me to wait for it. “Allowing” is the word I use, because God is giving me some room for growth as I learn to wait on Him. Did any of those definitions surprise you? To bind together?? Once, I heard someone say that she thought of waiting on the Lord in the same context of being a waiter or waitress (yeah, I know that is not PC, and interestingly, today that person is called a server). It makes sense to me. What do you do if you are a good waitress? Your main function is to serve other people. Humbling yourself to serve the needs of someone else, shows you place more importance on that person’s need than your own. A good waitress is smiling and happy to be helping you. She reacts quickly to what you need. She brings you exactly what you ask. By keeping an eye on you, she anticipates your needs, knowing when you are ready to order, need a water refill, or you are ready to pay your bill. Is this how I am waiting on the Lord? Smiling and happy? Quickly doing exactly as He asks? Tuning in to Him so I know immediately when He asks me? And, how do you react to a really good waitress? You are pleased and you tip well. The next time you come in, you might look for her and ask to sit in her section. You might even eventually build a relationship with her, learning about her life, her goals, her kids. She likes to see you come in, and you like to see her walking up to your table. I want this kind of relationship with God, one where I am pleasing to Him, one where He blesses me. 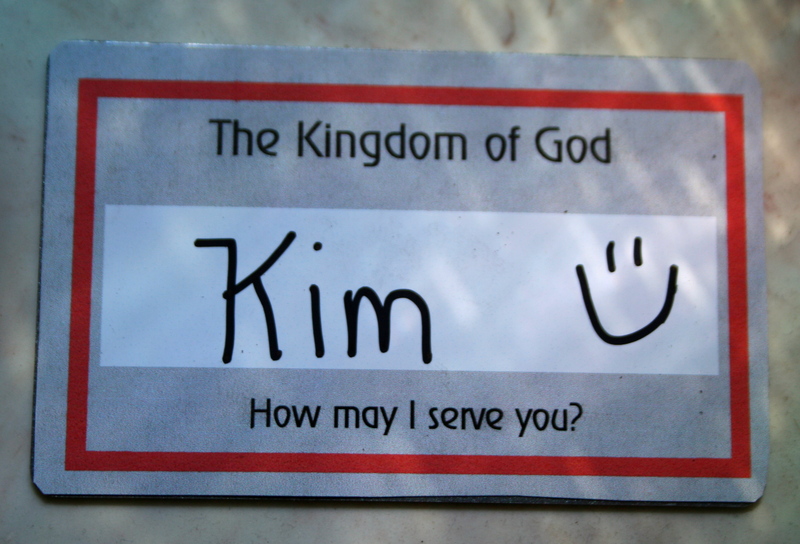 To remind myself that I am waiting on the Lord, and not to get ahead of Him, I made my waitress name tag. If you want to make one as a reminder, it is very easy! 1. Click on the above template and print it out. Cut out the two pieces (front and back) of your name tag. 2. Glue those two pieces back to back. 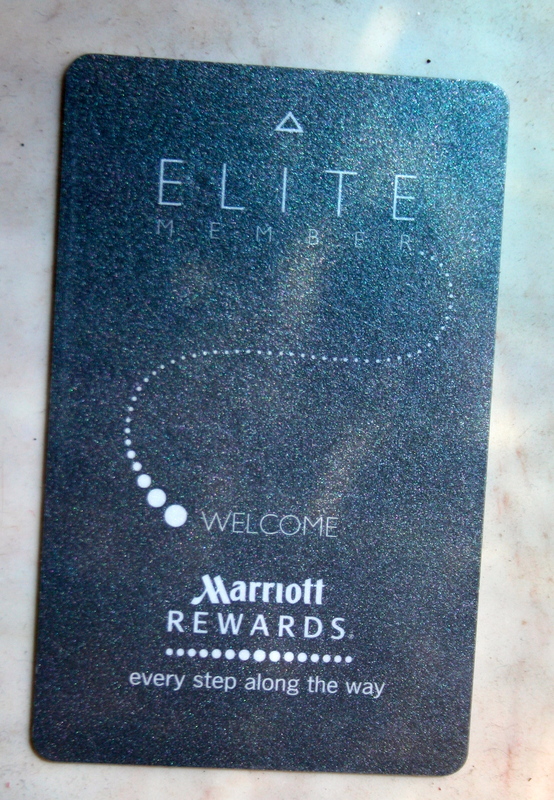 Or, if you want something more sturdy, glue the pieces to an old gift card or hotel room key. 3. Write your name on it! Put it in your bible, or place it where you will see it often. I think mine is going on the bathroom mirror so I see it at the start of every day. Several weeks ago, my job was relocated to New Jersey. Without me. Unemployment does not suit me, for many reasons, but I know that my God is the God who provides. Today, feeling like my conversations lately with God are mostly about me asking for His help, I asked for some guidance. Immediately, He gave me the Lord’s Prayer. As I started praying through it, I realized, though I had heard it and had spoken it a zillion times, I was finding it the perfect prayer for my current trial. 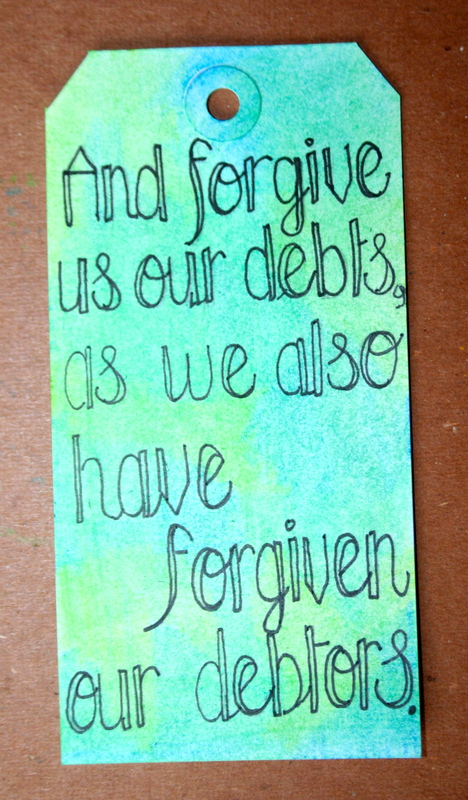 Not only did I think about what the prayer means, I made a quick tag book of it, to remind me when I need reminding. 1. 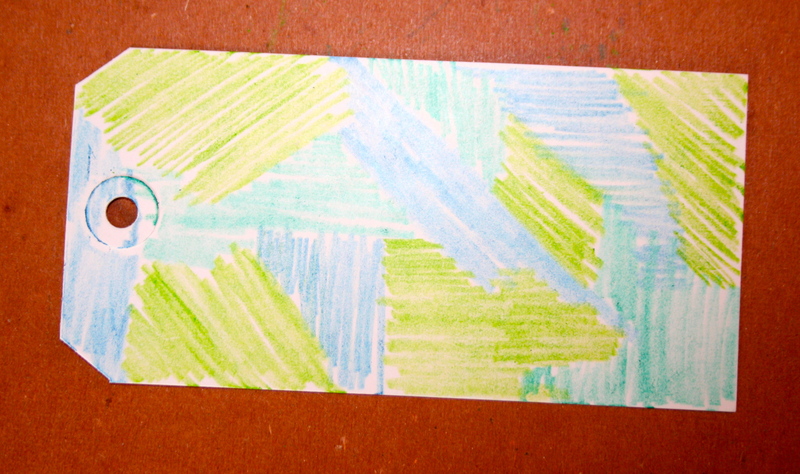 Color in one side of the tag, using the watercolor pencils. Perfection is not needed! Do all 5 tags. 2. Rub the color with a baby wipe or damp sponge. How cool is that? This technique makes great backgrounds and is so easy. Do all 5 tags. 3. 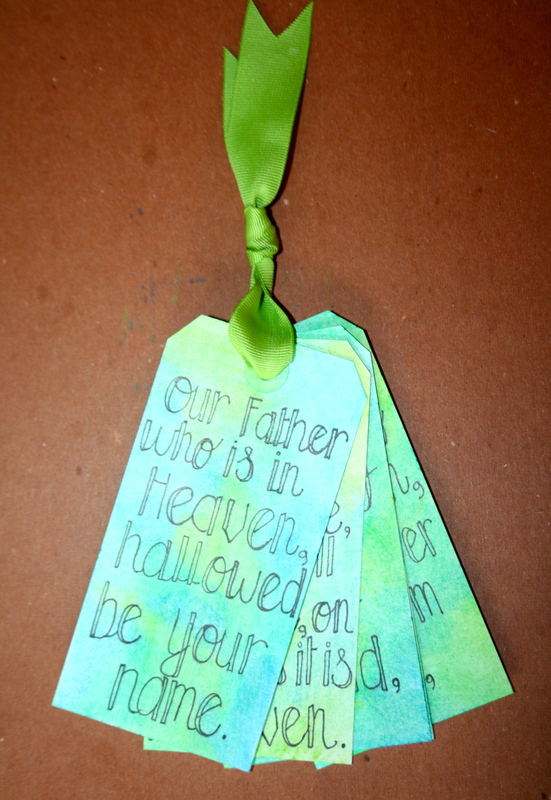 Using the marker, write or print a verse on each tag, 9-13. If it helps, write the verse in pencil before tracing with the marker. Do all 5 tags. 4. String the ribbon through all 5 holes, and knot above the tags. The backs of the tags are blank. 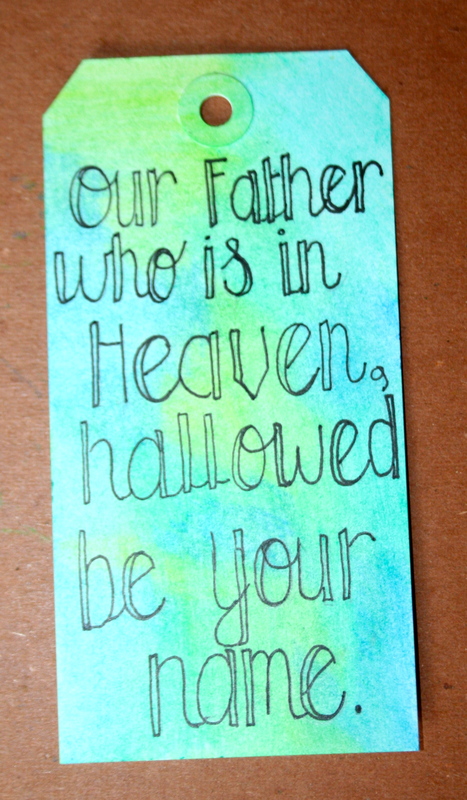 On them, you can write specific prayers or notes that you want to remember. I am praying to my Father, who lovingly and personally, listens to my prayers. Even when I ask for a job every single day. He surpasses everything on earth. Giving me a job is not hard for him. A study of the word “hallowed” (hagiazo), tells us the name of God is the opposite of common. It is made holy. His name is set apart. May His perfect will be done here on earth and in my life, as it is done in Heaven. That is exactly what I want… His perfect will, not my imperfect will. I must trust Him every day. 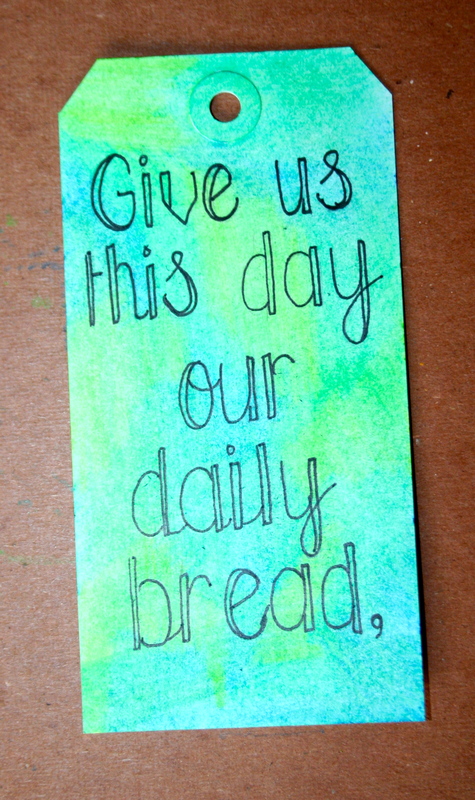 I will ask Him to give me what I need for today, just like He gave the Israelites manna in the wilderness each day. I don’t need to have today, what I will need tomorrow. And I will trust Him to provide each day, in His perfect timing. My new job will come on the day of His planning. I will be growing my faith in His provision, and not worrying. He is my sustainer and provider. Father, help me not to be selfish, to remember that what You forgive of mine is greater than anything You ask me to forgive of others. A word study of the word “temptation” (peirasmos) shows us Jesus was talking about a trial with a beneficial purpose or effect, a trial from God. That is exactly where I am right now. I need to depend on God for deliverance from the evil one and his lies. It is not true that nobody wants to hire me, that I will never find a job that is right for me, that I am worthless. Out of frustration, I found comfort in the Lord’s Prayer today. I hope you do too. Does the Lord’s Prayer fit your current situation? Last week, I read a short except written by Margaret Feinberg from her new book Fight Back With Joy. She told a brief story referencing a couple verses in Daniel, and it made an impression on me. In Daniel 3, Shadrach, Meshach, and Abednego were faced with a decision: would they obey the Babylonian king and the law to bow down to his golden idol, or would they be thrown into the furnace as punishment for breaking the law? Their beliefs were strong. 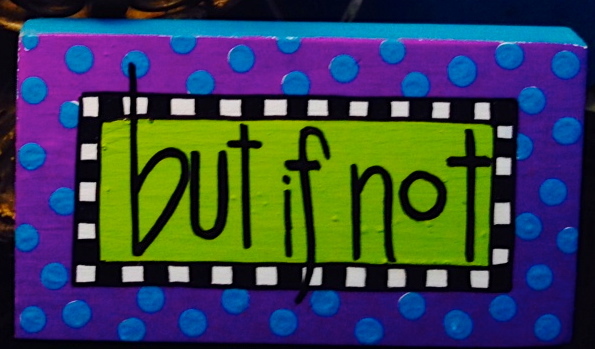 The important words there are “But if not”. The three boys were telling the king that their God could pluck them right out of the fiery furnace, but if He chose not to do that, they would still not worship another god. Their belief in God was absolute. They had no doubt that their God could save them from the furnace, and if that did not happen, they did not care, they still believed that God was Almighty. Sometimes I need a reminder of God’s absolute might. I know it, of course, but there are times when I put myself in charge. Yeah. I’m not really in charge, and life is a lot easier if I remember that God can pluck me right out of the fiery furnace. I sure can’t do that myself. So, here is my visual reminder. 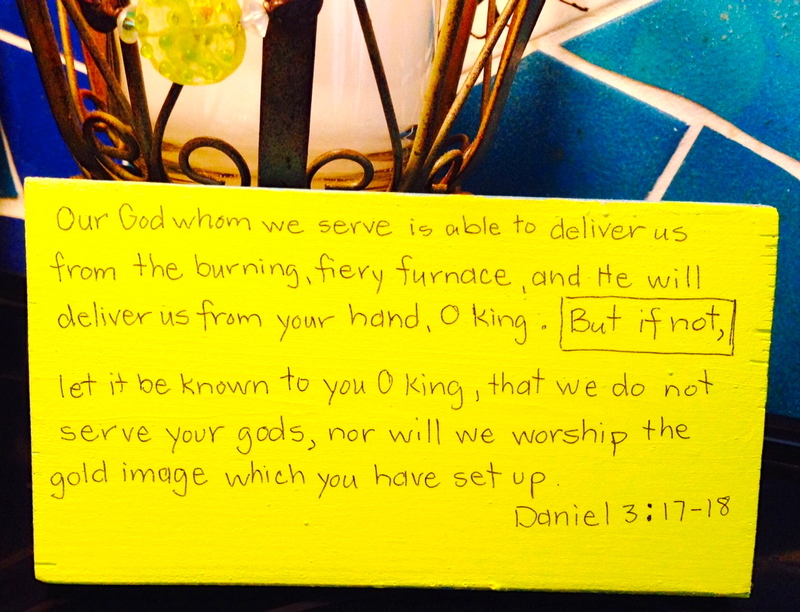 It started as a scrap of wood and now tells the story of the unwavering faith of Shadrach, Meshack and Abednego. 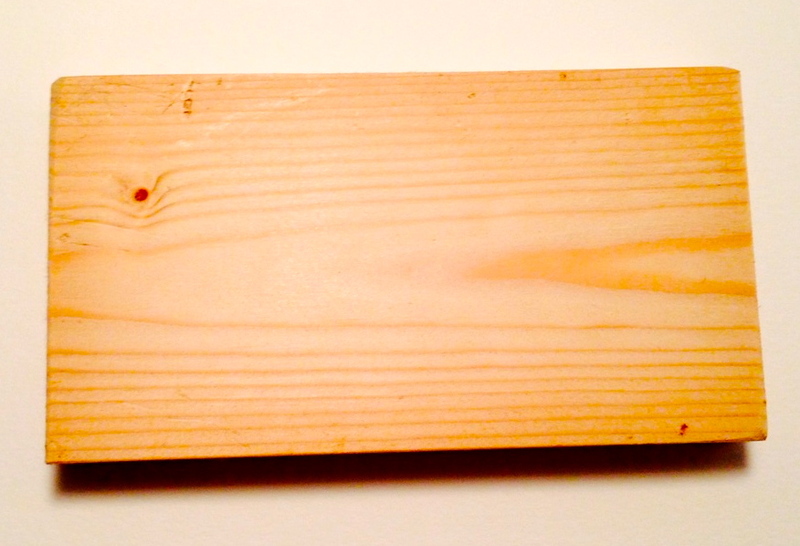 a piece of wood: mine is 4″ x 7″ and thick enough to stand on its own. You can use any scrap of wood, unfinished or already painted. You could easily do it on any surface: paper, terra cotta, tin, etc. The pattern is easy to adapt. 1. Paint the front and sides of the block white. Let it dry, or use your hair dryer to hurry the drying. Hold it no closer to the surface than about 10″ for best results. 2. 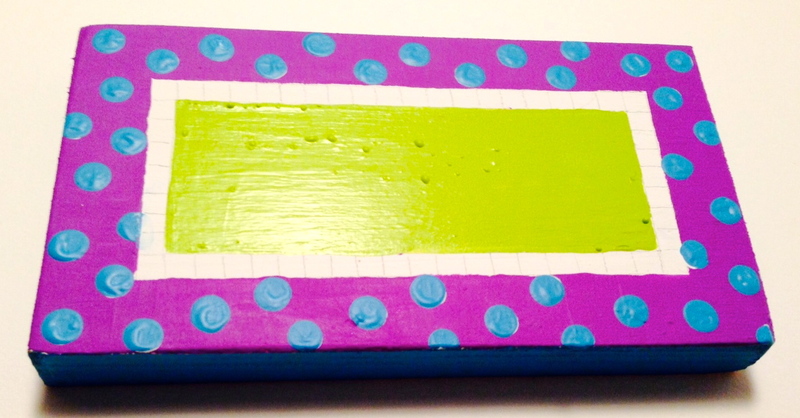 Paint the sides of the block one of your colors. Let dry. Paint the back of the block another color. Let everything dry. 3. Measure and draw an outside border of about 1″. Make your pencil marks light. Measure and mark a 1/4″ border inside the 1″ border. 4. 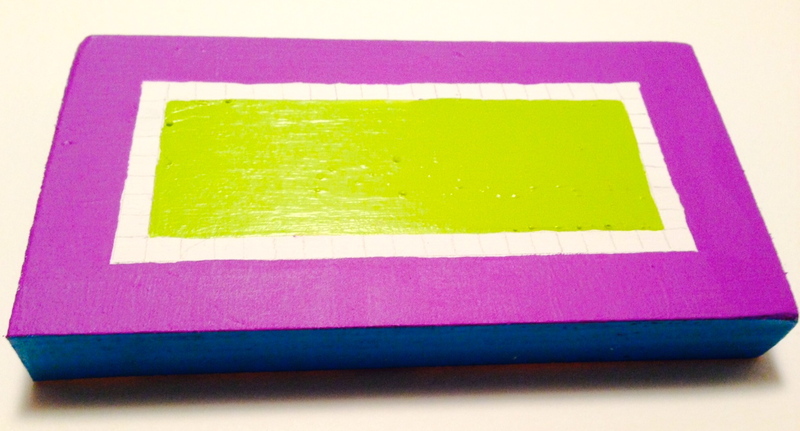 Paint the inside rectangle and the outside border in colors of your choice. Let dry. 5. 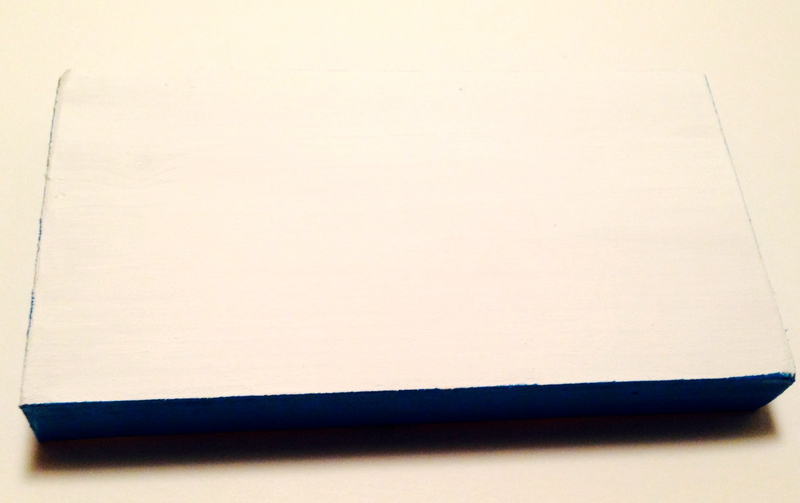 Squeeze a little paint out onto the palette. 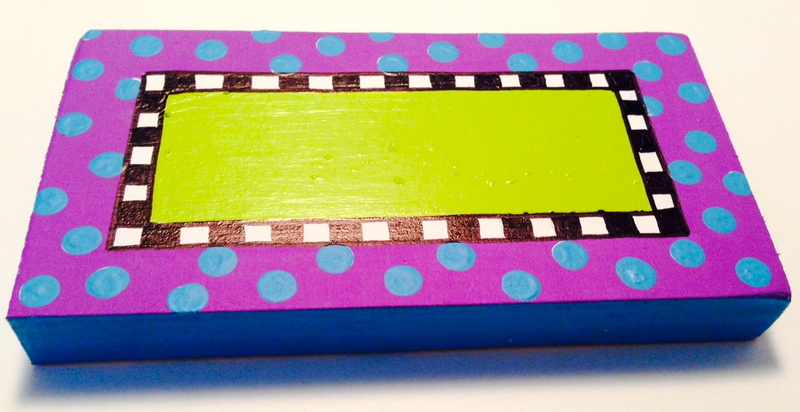 Dip the pencil eraser into the paint and print on the outer border. Continue until it is polka dotted. 6. Make black and white checks on the 1/4″ border. If it is easier to use a marker for this, use your permanent marker instead of your liner brush. 7. 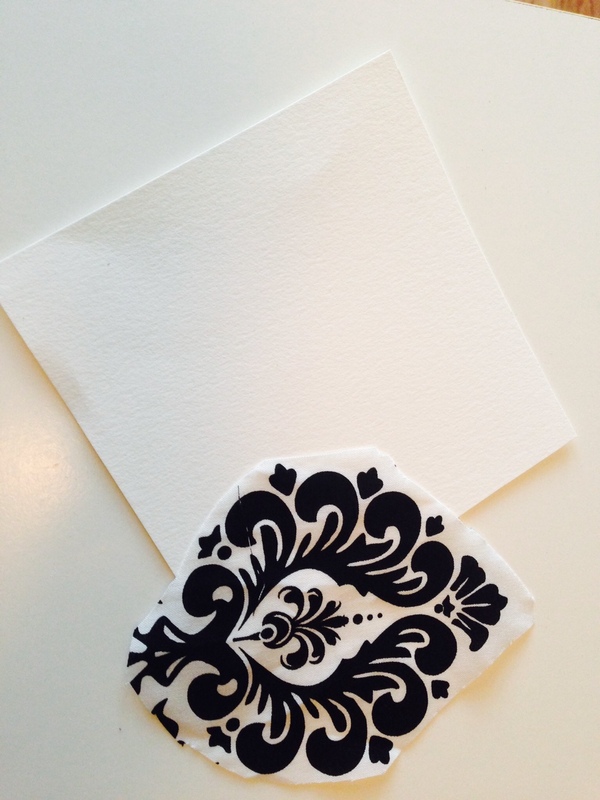 Using either the liner brush or the black marker, print or write in the center: but if not. You can freehand this or print it on your computer/printer, transfer it and paint it. 8. 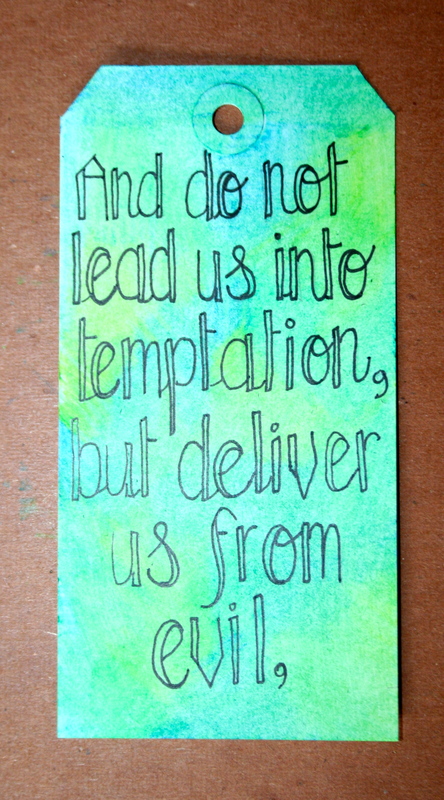 On the back side, using your marker, write Daniel 3: 17-18. Every time you look at your piece of art, you will be reminded that if God does not save you from the scary furnace, you know that it is not because He can’t. It is because He has a better plan. You believe that. 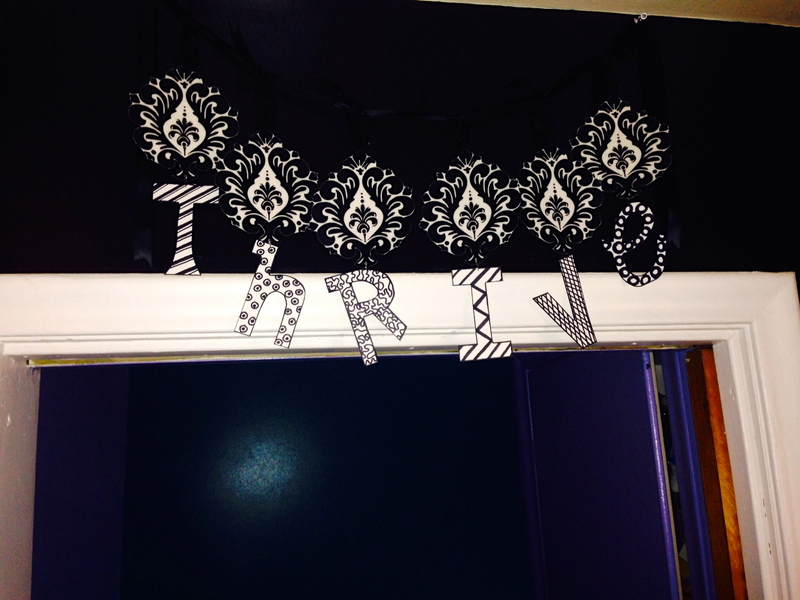 I have chosen THRIVE as my word for 2015. I am feeling like I have been just barely surviving, and I know God has more planned for me than this. I also desire more for myself. 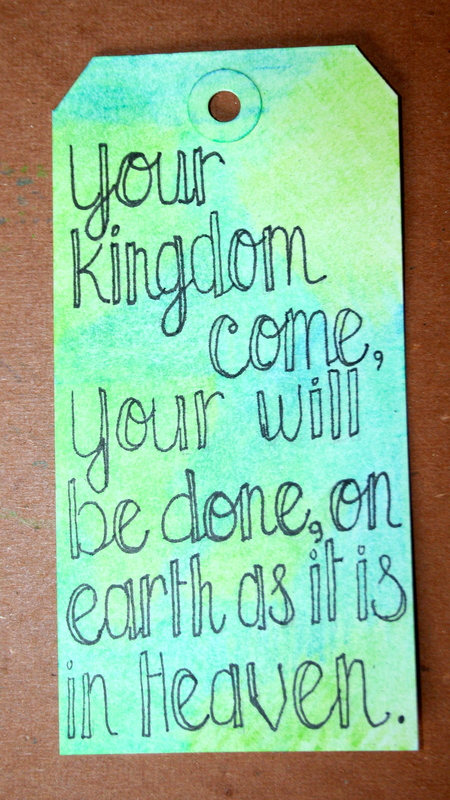 I will be studying this word and praying about this word and how I can live it, throughout the year. 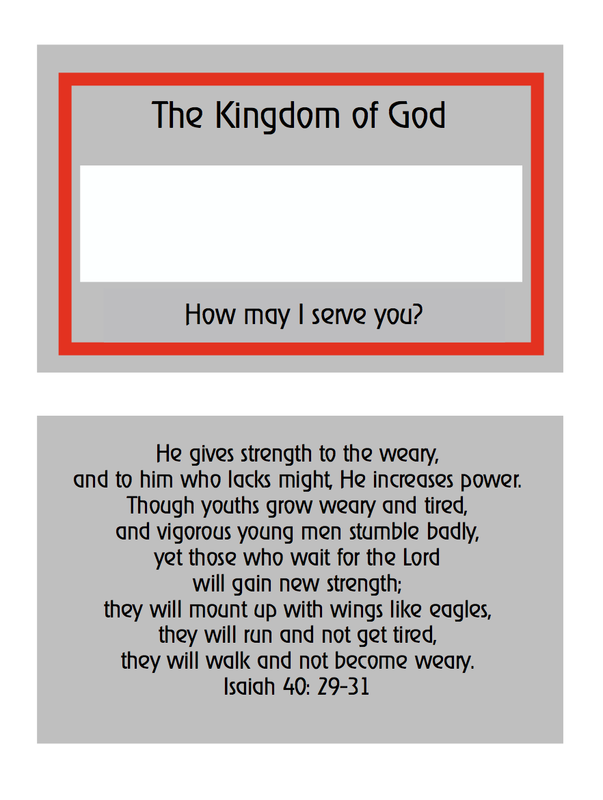 The first verse God has provided, has given me kind of a logo for the year. Trees will be my visual reminder of thriving. To have a visual reminder of this, I made a decoupage swag and hung it over the door that leads out of the house. I will see it every day on my way out. 1. Choose a fabric with a repeating design like a medallion. Decoupage 6 medallions to 140 lb. watercolor paper. Go here for a tutorial on basic decoupage techniques. 2. Cut out the dry medallions. Use a hole punch to punch a hole at the top and bottom of each medallion. 3. Print out the word THRIVE. Use a copy machine/printer to make the following letters to the size needed to go under the medallions. Transfer the letters to watercolor paper. Go here for a tutorial on transferring patterns. Draw desired patterns on each letter with Sharpie marker. Cut out each letter. Punch a hole at the top of each letter. 5. Cut one ribbon long enough to hold all of the medallions. Cut 6 shorter ribbons to tie the medallions/letters to the swag ribbon. 6. Once assembled, tie to a curtain rod, or use push pins to attach to to the wall, or paperclips to attach to the top of a lampshade. Hang your swag wherever you will see it a lot. Of course, you should change the color scheme, design, and word to be what you need, if THRIVE is not your choice.